Students gathered on Wednesday in University Crossing’s Moloney Hall to voice their concerns at the annual Student Open Forum on Campus Dining, sponsored by the Student Government Association (SGA). Associate Vice Chancellor of Student Affairs Larry Siegel joined Aramark staff on giving updates about future developments related to campus dining, as well as offering answers to student grievances revolving around campus dining. After dinner, Siegel opened the forum by shedding light on UMass Lowell’s continued relationship with Aramark as its food service provider for the last 28 years. “Though imperfect, [Aramark] clearly [has] the best balance of all the factors that exist on campus,” said Siegel. He emphasized Aramark’s donation of over $18 million to the university to help fund renovations of the dining halls in Fox Hall, the Inn and Conference Center and the Hawk’s Nest at University Suites. Siegel then gave updates on the university’s ongoing capital projects of renovating Cumnock Hall and the Hawk’s Nest at University Suites. The million-dollar renovation of the Hawk’s Nest at University Suites is on track to be finished by January 2018 and, modeled after the dining hall at the Inn and Conference Center, it will offer a full-service dining experience to students at a smaller scale compared to Fox Dining Commons. University officials decided to convert Hawk’s Nest after realizing that the dining hall at Fox is not big enough to accommodate the additional 750 students living on campus with the opening of the River Hawk Village complex. It is the hope of many university officials that Hawk’s Nest will be the answer to students’ requests of expanded dining hours for student athletes and students with late classes. Another capital project, slated to be completed in September 2018, is the renovation of Cumnock Hall. Dubbed as the “North Campus Living Room,” Cumnock is envisioned to serve as a new place for students to hang out in between classes. 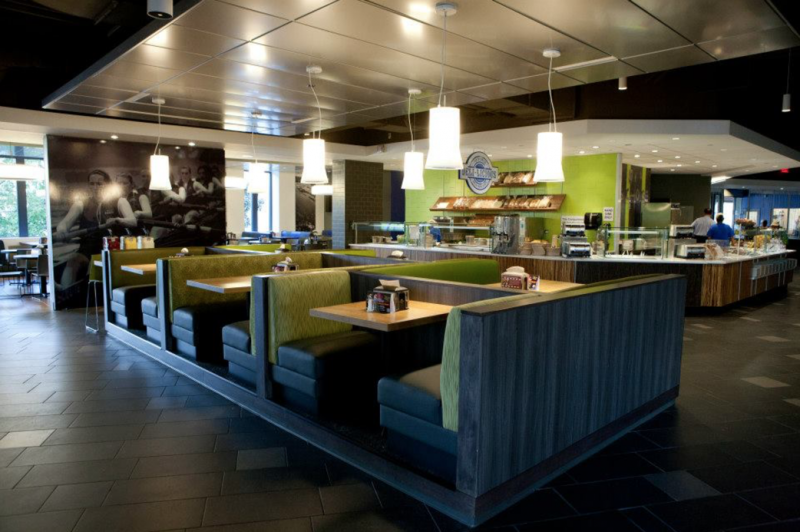 Modeled after South Campus’ McGauvran Center, Cumnock Dining increases seating, especially for commuter students, and compensates for the lack of green space on North Campus as compared to South Campus. After the presentation, the floor was opened to students. Some of the biggest concerns students said they had centered on the dining hall’s hours and the cleanliness of the dining halls. Informal polling conducted by Siegel among the students in the room revealed that the majority of students at one point or another have gone to the dining hall with less than optimal offerings, especially in-between meal periods and on weekends. Others mentioned the constant lack of utensils during peak meal periods, and how often small utensils are not washed properly. In addition, many students reported multiple sightings of mice running all over the dining halls. “The carpentry department is aware that this is a huge problem. They’ve been actively laying down baits and traps,” said Siegel. According to Siegel, many of the rodents have come from active construction around the campus that has stirred the ground. A few students mentioned the dirtiness of the floor, especially around the Sizzle station, where fries are constantly found all over the floor in the Fox Dining Commons. Siegel said that last year’s policy change which lead to the union prohibiting workers behind the counter from doing tasks in front of the counter. By the end of the forum, students who still had concerns were encouraged to complete the surveys seen at the dining halls and to reach out to University Dining leadership team wearing white chef coats.